Head out to the frosty Arctic in two awesome adventures where you help to decide how the story ends! Will you climb to the top of Penguin Island, or take a plunge to the frozen depths? It’s in your hands – um, flippers! In The Inventor’s Apprentice, Gary the Gadget Guy is creating an awesome invention to make the penguins’ lives easier – and more fun! You’re going to help him out … but will you come up with something truly amazing? Or will the project go terribly awry? 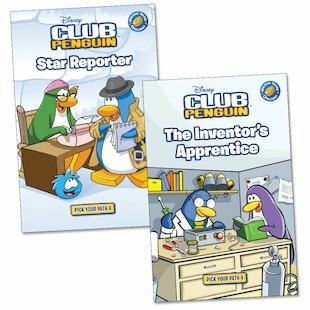 And in Star Reporter, you’re joining editor-in-chief Aunt Arctic to go to work on the Club Penguin Times! But will you report on a party at the Iceberg or cover the big ice hockey game? How does it end? You choose! PLUS – unlock extra Club Penguin website items using the cool codes inside the book! Hmm, I like the pick-your-own-path idea, but I don’t like Club Penguin. So, not so good. I have all four of these but I loved all of them they are great! If you need reccomendations or if you should get this book then I say you SHOULD AND HAVE TO get this book! You will enjoy this book the most if you are a Club Penguin user or lover! I am!